Fiji’s beaches are known to be some of the most pristine and idyllic in the world. These stretches of white sand and gorgeous ocean leave a lasting impression in the hearts and minds of guests from all around the world. Today we spotlight a few of our favorite beaches for an unforgettable Fijian vacation. Whether you are coming to Fiji to celebrate romance, adventure, family, or simply looking to relax and be inspired, Fiji’s beaches will keep you dreaming about your remote, tropical island getaway well beyond the vacation. Check out our list of some of our favorite dreamy tropical Fijian beaches. Located on the main island of Fiji, Viti Levu, Natadola Beach is one of those rare gems along Fiji’s famous Coral Coast, just 30 minutes from Nadi Airport. Picture a stunning crystal clear beach with waves and tiny little sand bars stretched out as far as the eye can see. You will find no other beach in Fiji like Natadola. The white sweeping beach is long and perfect for a romantic stroll or swimming! In fact, this beach even has waves for novice surfers and is great for body surfing. It’s certainly not a still, calm Fijian beach! And at the ends of the beach you’ll find excellent snorkeling. Bonus: you’ll receive stunning views of the sweeping waves of Natadola if you book a stay at the Intercontinental Fiji. The resort sits just behind this beach. Imagine waking up to a vast ocean view like this every morning! 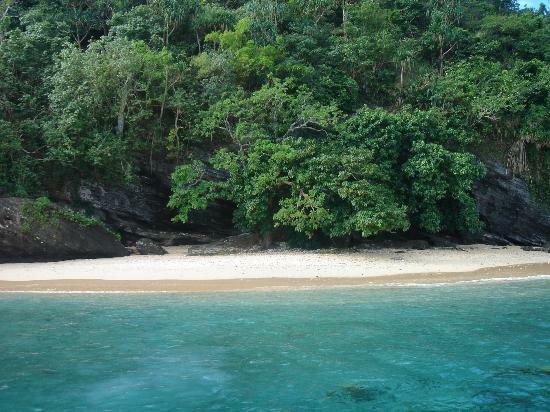 Liku Beach is found on the luxurious Tokoriki Island Resort in the Mamanuca Island Group. Liku actually means sunset in Fijian and perfectly named, there are a lot of sunsets ahead in your future if you stay here! In fact, many believe this west facing beach provides some of the best sunsets you will ever see. The lagoon and coral reefs of Liku Beach provides guests plenty of water activities to keep happy. Not only have you seen this famous beach on TV (yes, it was the beach on the Bachelorette Season 7 finale), but you will also find complete tranquility on the beaches of Vomo. Specifically check out the western side of the island for picture perfect views. Great views can also be found climbing to the top of the island for a stunning panoramic vista. If you are staying at Vomo Island Resort, also be sure to take a trip to the smaller private island owned by the resort, Vomo Lailai, or Little Vomo. Both of these beaches will have excellent snorkeling… besides being paradise… of course. Seagrass Bay’s coastline will truly dazzle. Found at the ultra-private Laucala Island Resort, the beach with long stretches of white sand and great snorkeling has beauty that rivals the most beautiful beaches in the world. In the calm and still beauty of the 3,000-acre island, Seagrass Bay will re energize. Go all out for a luxury getaway at Laucala in their Seagrass Villas and have the beauty of this Fijian beach delivered to your window every day. Visit Horseshoe Bay at Matangi Private Island Resort and see why it was included in the book, “1,000 Places to See Before You Die.” The horseshoe-shaped beach is not only stunning from the ground but it also looks just lovely from above! It’s such a unique beach and coupled with staying in a Matangi treehouse accommodation, it’s one of the most unique experiences for those seeking romance. Koro Levu Island is just one of those places that stays with you long after the trip fades. Located in Fiji’s north just a bit from Taveuni, Koro Levu Island is a perfect tropical oasis for honeymooners. It boasts a powder white beaches framed by swaying coconut trees. The half-mile crescent beach forms its own stunning aquamarine lagoon and its reef is home to world-famous diving. The Blue Lagoon Beach offers a sparkling Fijian water view along a lovely stretch of beach. While you are swimming, even without putting your head underwater, you’ll see colorful fish and beauty that lies just beneath the surface. The water is so clear!! Guests of Blue Lagoon Beach Resort can enjoy shark diving, snorkeling, amazing sunsets, and more.